Names of seven Marathi films that would compete for the Sant Tukaram Best Marathi Film Award were also announced. The 2019 EDITION of Pune International Film Festival (PIFF), scheduled to take place from January 10 to 17, would open with a Spanish film ‘Damn Kids’ and feature 150 movies from over 114 countries, organisers said on Friday. Names of seven Marathi films that would compete for the Sant Tukaram Best Marathi Film Award were also announced. Mulshi Pattern (by Pravin Tarde), Naal (Sudhakar Reddy Yakkanti), Khatla Bitla (Paresh Mokashi), Bhonga (Shivaji Lotan Patil, Chumbak (Sandeep Modi), Bodhi (Vinit Chandrasekharan) and Dithee (Sumitra Bhave) have been shortlisted to compete for the coveted award. Celebrating this year’s theme of the festival, ‘In Search of Truth’, to commemorate 150th birth anniversary of Mahatma Gandhi, two critically acclaimed films — The Making of Mahatma (1996) (directed by Shyam Benegal) and Gandhi (by Richard Attenborough) would also be screened during the week-long festival. Benegal and Rohini Hattangadi, who played Kasturba in Gandhi (1982), would also share their experiences while working on the films at the PIFF Forum. The festival would also showcase some of the popular works of director Mehboob Khan. His movies Amar (1954), Andaz (1949) and Mother India (1957) would be screened during the festival. Movies of Italian master Bernardo Bertolucci, like The Last Emperor (1987), Little Buddha (1993) and Last Tango in Paris (1972) will also be shown. 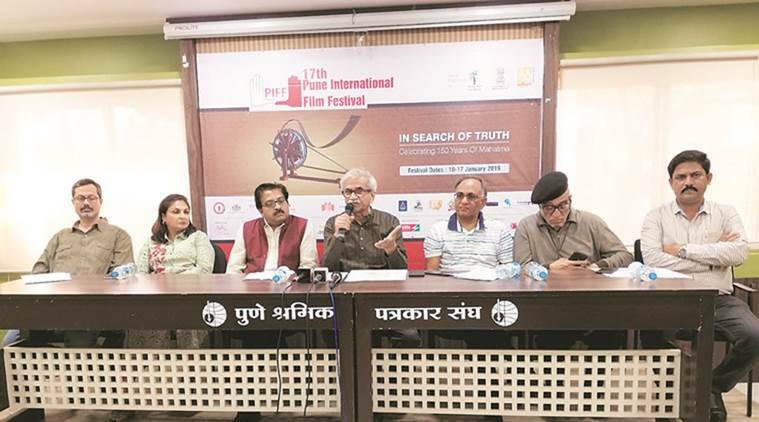 On Friday, PIFF Director Jabbar Patel, Secretary Ravi Gupta, selection committee members Satish Alekar, Abhijeet Randive, Pune Film Foundation Trustee Sabina Sanghavi, National Film Archive of India Director Prakash Magdum addressed the press conference. PIFF would also screen a few movies to pay homage to the artists who passed away last year, including Sridevi (English Vinglish) Kalpana Lajmi (Rudaali), Shinobu Hashimoto (Japanese Screenwriter, To Live) and Mrinal Sen (Bhuvan Shome). Jabbar Patel said the PIFF Forum would also host talks, workshops and interviews for young and aspiring filmmakers, who, he said, form bulk of the PIFF audience. “This year, a lot of activities for aspiring writers, producers, directors, costume designers, like workshops, seminars, panel discussions, networking sessions, exhibition stalls etc. will be organised. The main intention of the PIFF Forum is to educate those interested in filmmaking,” said Patel. The annual Vijay Tendulkar Memorial Lecture would be delivered by famous screenwriter Kamlesh Pandey, Patel said.